The crypto market is down significantly today, practically across the board of all coins, following a report that claims Goldman Sachs has backed down on plans to start a dedicated cryptocurrency trading desk. Bitcoin is down over five percent in the last 24 hours, but ‘altcoins’ have been hit harder. 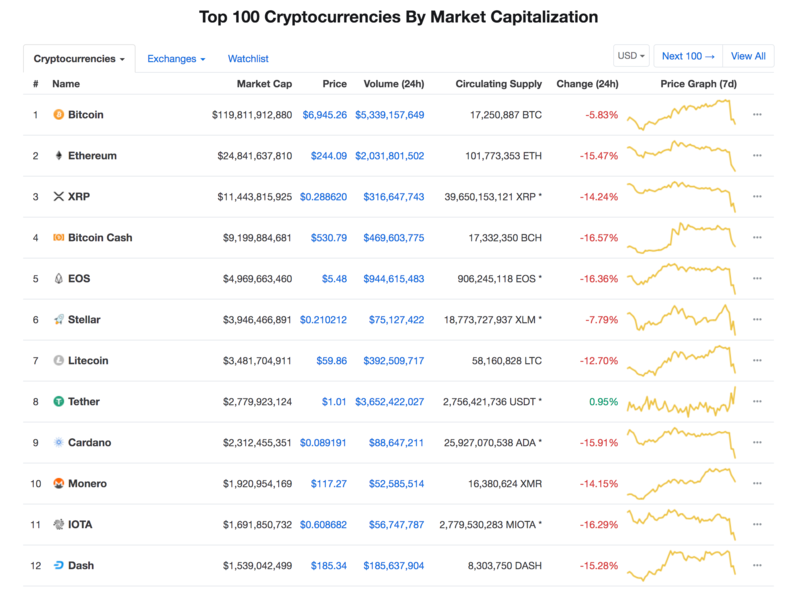 Ethereum (down 14 percent), XRP (down 13 percent), EOS (down 16 percent) and Litecoin (down 11 percent) are seeing bigger drops, according to data from Coinmarketcap.com. Business Insider reported this week that Goldman has backed down on its aspiration to enter crypto trading due to continued uncertainty around regulation. That’s according to sources, although it does appear that the bank is holding off making a full-on commitment to crypto. “At this point, we have not reached a conclusion on the scope of our digital asset offering,” a Goldman spokesperson told Reuters in a statement. Added to that, there may also be some concern around a Reuters reported that claims the EU is looking into regulating crypto. The organization is said to be preparing a report that proposes regulation of crypto exchanges and ICOs. Goldman has never gone public with its intention but reports first surfaced of its plans back in December 2017. That period was one of the peaks for crypto. During a bull run in December and January, the value of Bitcoin touched almost $20,000, that’s a record high and significantly higher than today’s price of just under $7,000. So, in addition to regulatory concerns, the fact is that there is ongoing uncertainty around Bitcoin and the crypto more generally from an investment perspective. While it is worth noting that, counter to that, many in the industry believe price stability has many benefits because it allows a stronger focus on technology and product, it is clearly a problem for banks like Goldman which are ultimately focused on making money.